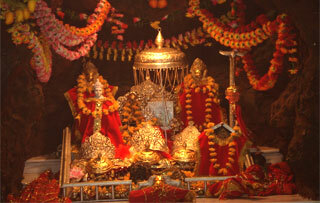 Vaishno Devi Cave tour is one of the spiritually uplifting pilgrimages in India. Located on the top of the hillock, this cave tour is dedicated to the Holy Shrine of Mata Vaishnavi who had spent years and years into meditation inside this holy cave. As a result, this cave is charged with spiritual synergy and is believed to bestow the wishes of the pilgrims. The devotees, with the devotion and surrender in their mind trek through the steep path that takes them to the Bhawan, where the holy cave is located. Inside the cave, the Devi is represented in the form of three natural rock formations called the Pindies. These natural pindies symbolize the three forms of the Mother Goddess or Shakti. The first pindi is dedicated to Maha Lakshmi, the goddess of wealth; the second is Maha Saraswati, the goddess of knowledge and the last amongst the trinity is Maha Kali, the destroyer of all evil. From Delhi, board the Rajdhani Express for Jammu. Dinner and overnight onboard in the train. Upon arrival in the early morning, transfer to hotel in Katra. After breakfast, trek to the Bhawan with Yatra Parchi (14 km) along with fellow pilgrims heading towards the single goal; to reach the shrine and seek the blessings of the goddess. After the Darshan, trek back to Katra. Next morning is at leisure in Katra. In the evening, drive assistance towards Jammu to board the Rajdhani Express to Delhi. Dinner and Overnight on board in the train. Tour ends on arrival at Delhi. Vaishno Devi Cave tour can also be availed by surface (road trip) for 4 Nights / 5 Days and also via air and Helicopter (1 Night / 2 Days). For details on such specialized tour to Vaishno Devi Shrine, fill up your details in the query form below.